After this post only TWO MORE DAYS! I can’t wait to write my recap/opinion piece on my #100daysofhappiness! LOTS of great things are happening! My BEST FRIEND/AOII SISTER came to visit me this weekend and we had so much fun! Find her blog here :). We did an outdoor Smart Barre Class at Trailhead in Fort Worth! 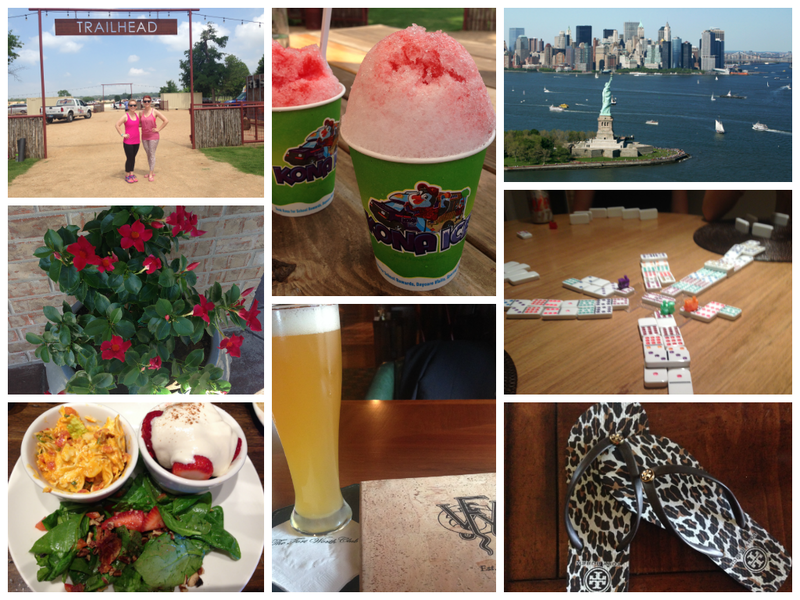 SO much fun… but we definitely got sunburned! Afterword Kona Ice was there with free snocones! YUMMY! My flowers are blooming like crazy! Bought these Diplandia’s on a whim and they have been so easy to take care of **KNOCK ON WOOD**! While Paula was in town we ventured to La Madeleine since they don’t have one in Oklahoma! We had the Sampler and our favorite Strawberries Romanoff…. TO DIE FOR, SERIOUSLY! I think I need to find a Pinterest knockoff…. Mark and I also became members of the Fort Worth Club this week! I am excited to try out some of their events! We had a great meal there the evening we did the tour! We went to a housewarming party and acted like we were in college again playing games and enjoy everyones company! We even busted out some Mexican Train (domino’s game)… SO FUN! Another fun thing that got planned this week is Mark and my trip to NYC! Mark has never been so I am excited to get to go on this adventure with him! FINAL thing… Tory Burch had a sale a bit ago that I talked about and I am OBSESSED with these leopard flips! Previous postLet me tell ya about my best friend!